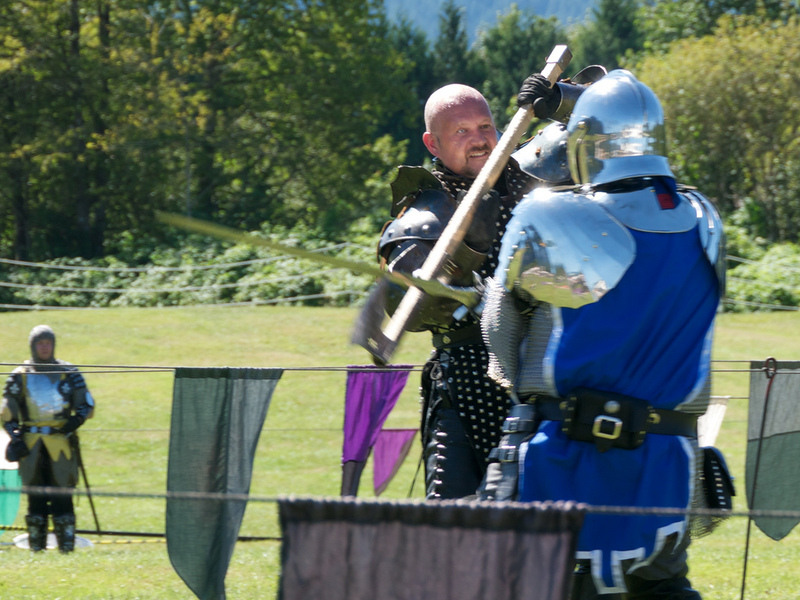 The Seattle Knights will show off their combat skills at the Medieval Country Faire. Photo by Peter John Hill. If you come across fairies and knights in full armor in Volunteer Park this weekend, don’t worry, you aren’t suffering hallucinations induced by the last of the summer heat. This weekend marks the first annual Medieval Country Faire hosted by the Friends of Ernest Hemingway with an appearance from the Seattle Knights, a group of professional performers who teach and participate in armed combat choreography. Villagers are promised good food, music, games, an appearance from the king and queen and more. CHS has asked the city’s Department of Neighborhoods what their involvement with the fair is as the organizers list them as a sponsor of their website. We haven’t yet heard back from the city and the neighborhood coordinator for Capitol Hill is on vacation. But we have learned that the group applied for DON grants last year and was denied and a search of 2010 grants does not include any money provided to the E. Hemingway Society group that is organizing the event. We’ve tried several times this week to get in touch with the group but they have not returned our e-mails and the only phone number listed on the site is for a fax machine. This all might not mean much — the group is likely busy getting ready for the weekend’s fun; it takes awhile to lace up corsets and don plate-mail armor. wrestling matches, water balloon fights, 5 horse drawn carriages to promenade the park and of course, The Seattle Knights “Battle Royale”. Today, merchants and arti-sans have gathered to purvey their brightest and finest to the people of the town! Actors, juggles, choristers, musicians, gamesters, fools, knights and ladys, our King and Queen, and many others have traveled to this happy place to ply their noble trades, and we abound in shamans, conjurers, and sages of all varieties. And there is yet more! Today, the wise man Merridwyn ( or “Merlin” , as the later ages will know him) has visited, perhaps to advise the highborn nobles and knights who’ve come to visit. There will be sword fighting! Drama and Adventure! High action and low comedy, learning and gaming, and fun for all. Honest tradesmen, wise teachers, dashing rogues, cunning herbalists, ambitious squires, scurrilous scoundrels, and many more characters will greet and interact with you dressed in ancient garb. Welcome! Relax and enjoy our many entertainments throughout the village. Take an enthralling and educational nature walk. Read omens with our own auger. Take enjoyment in fine foods and drink! Enjoy the sun gleaning on our beautiful water reservoir. So, enjoy the old timey glory September 4th and 5th from 12 pm. to 6 p.m. Lords and ladies need not dress in period garb to be granted entry. This entry was posted in Uncategorized by Frances E. Dinger. Bookmark the permalink.